Horse Temperament: Does Your Shao Yin Lack Self-confidence? Self-confidence is something every good horseman wants to see and develop in a horse. 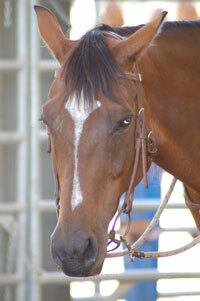 Horse temperament has a lot to do with the level of self-confidence a horse is born with. Wood horses are confident from birth while the Shao Yin temperament tends to be the most naturally timid. Based on my observations, this is the way I see horse temperaments rank most to least in natural self-confidence. Good horsemen will strive to bring out a horse’s natural self-confidence and build it in those that are lacking. A confident Wood horse needs firm, consistent boundaries to be reminded that the world does not revolve around him alone. At the opposite end of the spectrum, the Shao Yin needs extra hoof holding to help him overcome his lack of confidence. Here would be a typical scenario with a Shao Yin. You bring your Shao Yin to a horse show for the first time. Your goal is not to show but simply let him be exposed to a new place and all the sights and sounds associated with showing. You know your Shao Yin gets nervous with anything new so you bring his trusted, seasoned campaigner friend along to keep him company. Despite your best efforts, your Shao Yin is still overwhelmed with the new environment. He breaks a sweat, paces his stall and whinnies constantly even though his horse friend is in the stall right next to him. You hang a hay net, but it is ignored. Everything about him screams, “take me home, I can’t handle this”. You think he will settle but after several hours he is no better so you load him up and head home to avoid a stress colic. Building self confidence in a Shao Yin should ideally start when he is a foal. Unfortunately, his insecurity may not be recognized and he gets handled just like all the other more confident foals. Something as simple as rough handling during deworming or hoof trimming can shatter his fragile self-confidence and set him up for future meltdowns. Another critical time comes when the Shao Yin is started in training. The Shao Yin is intelligent and learns quickly but it is very important that he not be asked for too much at a time. For example, when teaching him to lead, the first lesson may just be having the halter go on and off his head a few times with lots of praise. Once he accepts the halter on and off, you can add the lead and begin to ask for him to yield his head each direction. With saddling, the same applies. Just have the blanket and saddle on and off and call it a day. Build on this. Lead your Shao Yinto the arena and let him watch his friends have good experiences with being ridden. Never move to a next step in training until your Shao Yin is relaxed. Trust the extra time spent early with a Shao Yin will pay off later. The Shao Yin horse temperament will get braver as he matures if he is started well. The great news is that the gentle, sensitive nature of the Shao Yin makes him a great kid horse when he is seasoned himself. He seems to sense and relate to the lack of self confidence in a young or inexperienced rider. So what can you do if you have a Shao Yin who did not get the best start in life. Resist the temptation to reach for drugs. These may get you through a day but they won’t help your Shao Yin learn or gain confidence. Let’s look at the above first show scenario and see what could be done to have a better outcome. Let’s assume your Shao Yin is pretty good at home and has been around other horses at your barn. He has also been hauled a few times for you to ride at a friend’s so he has been off your property. Your plan to take a trusted horse friend is very good but you will also want to support your Shao Yin’s digestion by feeding a good prebiotic such as Ration Plus. Give a dose of Ration Plus along with 2 to 4 Focus Biscuits about 1 hour before you leave for the show. Drive to the show and park your trailer in a cool place near the action, but do not unload. Hang a hay net and let your horse and his buddy hang out for about an hour then drive home. Do this until your Shao Yin will stand quietly in the trailer and munch hay. Then you can graduate to unloading and having a quick walk about the grounds with his buddy and then home. This may sound like a lot of work, but contrast it to the above situation where you lost ground on your horse feeling safe at a show. The Shao Yin horse wants to please and he is talented which makes him a wonderful show horse when he has developed his self-confidence. The extra effort spent with him is worth it. You will look back and appreciate that you took the extra effort to build confidence when you are busy collecting your ribbon or paycheck. You can also take pride in the accomplishment of having a healthy, happy and safe horse partner. Unless otherwise attributed, all material is written and edited by Madalyn Ward, DVM. Copyright (c) 2019 HolisticHorsekeeping.com and Madalyn Ward, DVM. All rights reserved. You can get off this list by going to http://www.holistichorsekeeping.com or by sending an email to info@holistichorsekeeping.com. This entry was posted in Five Element Personality Typing, Five Element Training, Newsletters and tagged building confidence in horses, horse self-confidence, horse temperament, Shao Yin on April 15, 2019 by Madalyn Ward, DVM.